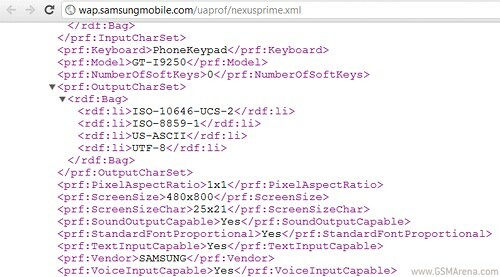 The Samsung Nexus Prime has appeared in a user agent profile (UAProf) on the Samsung website. The device model number will be I9250 and it will have a 480x800 (WVGA) resolution display. Previous rumors hinted at a 720p screen ala Galaxy Note, but that's obviously not happening. There's nothing else that we can deduce from this leak, but previous rumors suggested that the Nexus Prime will pack a 4.5-incher of the SuperAMOLED (Plus or not) variety and a Exynos chipset with a dual-core 1.5GHz processor. Last, but not least it will feature the latest version of Android - 4.0 Ice Cream Sandwich. Update: The page is no longer available. Hat tip to Annkur for sending in this info.